IRAQ BAGHDAD DOCUMENT WITH OTTOMAN REVENUE STAMP DEED OR SHARE 1335 H 10000 LIRA . Shipped with USPS First Class mail . (Sr3579/88). Very high catalogue value! Erhaltung: ungebraucht mit Falz(-resten), mint lightly hinged MLH. 1931 25 Rupee Unmounted Mint. Hinged on Selvedge Only. Light Horizontal Gum Bend. ALL DIFFERENT Very Fine, Mint Never Hinged Complete sets & Souvenir Sheets with many Better. Very clean collection of. Doing that is against U.S. and international laws. 6 Autumns Way, Brookfield, Connecticut 06804, U.S.A. Very fine mint hinged no faults - no creases - not thins etc. Mounted mint at top left of back scan - light creases - one black dot. 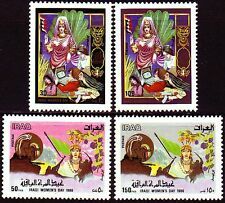 IRAQ - 1920/23 OFFICIAL 5r ON 50pi ROSE-CARMINE. 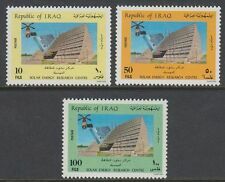 FINE MOUNTED MINT(MH). U.K. - £1.00. 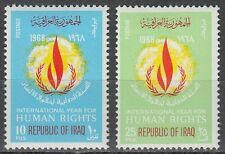 EDW1949SELL : IRAQ Grouping of all Very Fine, Mint NH sets & Souvenir Sheets. Grouping of all Very Fine, Mint Never Hinged sets & Souvenir Sheets. Neues AngebotIRAQ 1918 SG 1/14 MINT Cat £190 . Complete Set of 14. Mounted Mint. (St3887) Mi. D 305-309, 9mm weiter Abstand, 9mm space between. Dies ist kein Muster, Sie erhalten exakt die abgebildeten Marken. Erhaltung: ungebraucht mit Falz(-resten), mint lightly hinged MLH. (St3845) Mi. This is no sample, you get exactly what you see. 1917 1/2a on 10pa Carmine SG20a P.13.5. Baghdad Iraq. In British Occupation. Year of issue: 1917. Era: King George V (1910-1936). Type: Single. British Honduras/Beli​ze. Grade: Very Fine. 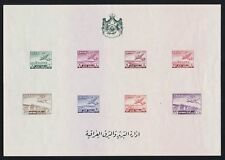 Iraq 1932 KGV set complete very fine used. SG 138-154. Sc 44-60. 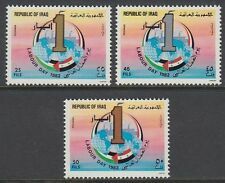 Iraq 1932 KGV set complete very fine used. Gibbons # 138-154. Scott # 44-60. Fine used - see scans -. 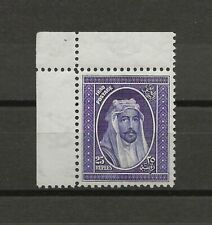 Fine used - see scans - the 1/2 dinar baby king faisal has a flat corner. S.G. T324//T337. EIGHT DIFFERENT ISSUES. 1917 1a on 20pa Rose SG14. Iraq Baghdad. Year of issue: 1917. V.F.U Example of this Rare Stamp. Type: Single. Grade: Very Fine. Condition: Used. More than 22,000 Item sold. Iraq 1949 Mi. Qualita' dell'oggetto - Qualita'100% : Lotto perfetto, senza alcun difetto. (St3642) Mi. Dies ist kein Muster, Sie erhalten exakt die abgebildeten Marken! Erhaltung: gestempelt, fine used. 1 1/2 FILS. WINGED CHERUB. IRAQ GERMANY 1929. This note is listed below 1990 SG number 1923 (see scan). SG.T326-328, 328b all light hinged mint. Also SG328ba/328b in MNH block. Cat£299 in SG 2009 sectional catalogue. All lots are sold as described. T324 & T325, T326, T329, T330, T334. IRAQ PALESTINE 1948. SIX PALESTINE AID.